The historic property where the Roberts store is located in Woody Point in Gros Morne National Park in Newfoundland, Canada, shows its age by the window alone. This old window is divided into four sections and slides up and down to open and is adorned by the red and wet wooden frame. Inside the window are some older looking barrels and these are just a few of the historic pieces found in the Roberts Store. Visitors to Woody Point, love to wander the historic property and update themselves on some of the history of Newfoundland. 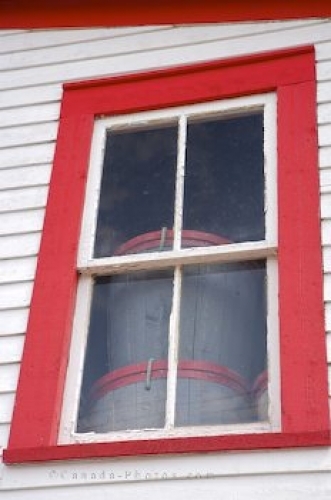 Picture of a dated window on the Roberts store found on historic property in Woody Point.